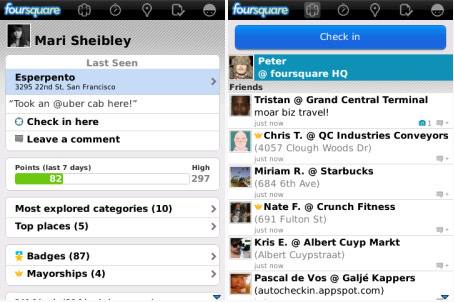 foursquare helps you explore the world around you. Meet up with friends. Find places to go. Save money with Specials. While on the go, you can easily tell friends where you are, share pictures, get their comments ("I'm right around the corner, I'll stop by to say hello"), and get insider tips and reviews ("order the Lobster Ravioli; it's the best dish by far."). Tons of places offer discounts and freebies to the foursquare community, and you earn points and badges for doing the things you love. If you want, you can easily post your proudest check-ins to Facebook or Twitter. It's like the old playground game, four square, but way more fun.